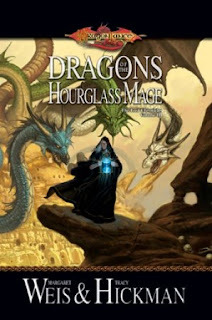 Dragons of the Hourglass Mage: The Lost Chronicles, Volume Three by Margaret Weis and Tracy Hickman is due to be released in Hardcover on August 4, 2009 (according to Amazon). I am sure this volume will prove to be a successful addition to the world of Dragonlance and further the Lost Chronicles series which started with Dragons of the Dwarven Depths (Book 1) & Dragons of the Highlord Skies (Book 2) back in 2006 and 2007. I personally cannot wait to hear more in depth about Raislit Majere and why he dawned the black robes. I loved book 1 and 2 as it really fills in some of the gaps that Krynn offers. You have a lot of "OH!" moments when you realize why things happened the way they did in other novels or what was occuring whilst something else was. Truly amazing and I love then authors take on the task to "complete" their original works and flesh them out. I have not read these books, although I have some of their early ones. So much good stuff out there to read.